On the 28th of May, the hugely successful, live interactive video game, The Dark Room makes its way to London! Part stand up comedy show, part theatre; interactive and insane, this is impro comedy + retro gaming combined into a deranged rock n’ roll game show all under the roof of the new venue Republic! Beginning four years ago as an online interactive web game, Australian stand-up comedian John Robertson posted his choose-your-own-adventure-game on YouTube, entitled The Dark Room. 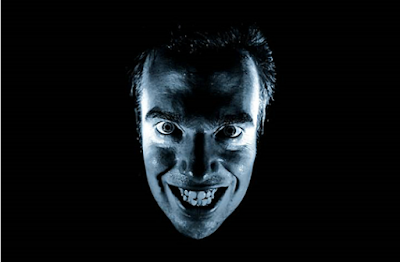 In the video, the viewer is told that they have woken up in a dark room, and have to find their way out – accompanied by some less-than-helpful suggestions from Robertson, spot lit by a torch under his chin. The various chapters of The Dark Room have been viewed more than 4,000,000 times on YouTube. Nobody has yet made it to the final exit. Online, it has been played in every country on earth, being curiously popular in Germany, France and the U.S. Inspired by its success, in 2012 John took the premise more than a few steps further, by converting it into a live show at the Edinburgh Festival in which a whole roomful of people AWAKE to FIND themselves… in a DARK… ROOM! The massive success of this show brought it back to the Fringe every year since and he has also played sold old shows from London to Hong Kong. Now he is brining the beloved format back to London, taking this improvised game show, where the player faces a brutal Old Testament God who loves grammar, and hates you. The whole audience joins in to see if they can find their way out of the Dark Room together. And we’ll give you a clue: chances are they can’t. Want to come check out The Dark Room? Find all the details you need just below and come experience the phenomenon!